One of my favorite things from IT Crowd is their “Hello IT” machine. It’s the perfect solution for lazy people who are tired of answering the same IT support questions again and again. With Twilio Functions and the new Speech Recognition we can build our own version of this machine with just a few lines of code. If you are not familiar with the answering machine from IT Crowd make sure to check out this video of it in action. Before we get going make sure you have a Twilio account. Sign up for free. The first thing we need to do is create a new Twilio Function that will handle all of our requests. 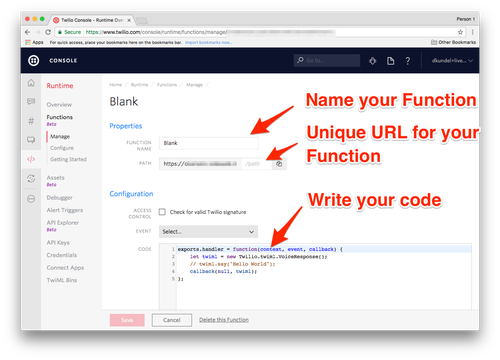 Twilio Functions allows you to host Node.js code directly within your Twilio Console. No need for you to spin up your own server. The code that you see is currently generating and returning an empty TwiML response. Additionally we have the option to name our Function and give it a path. Each account is given a unique base URL that looks like fancy-badger.twil.io, the path is used to differentiate between the Functions you create for your account. I’ll name mine “IT Support Hotline” and give it the path “/it-support”. You can give yours other values but make sure to replace it accordingly throughout the post. Let’s configure this to a phone number to be able to fully test it. Go to the Phone Numbers section and either click on one of your existing numbers that you would like to configure or purchase a new phone number. 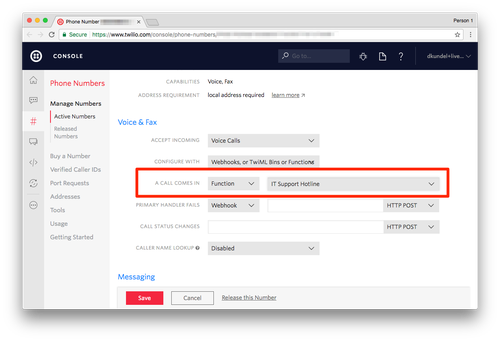 Once you are on the configuration screen, choose in the “Voice & Fax” section for “A call comes in” the values “Function” and the name of your Twilio Function. Save the changes and give your phone number a call. You should be greeted by a male voice with a British accent saying “Hello IT”. If the user mentions “thank” somewhere we say “You’re welcome, mate!”. If they don’t say it, we ask the same question again (because most likely they haven’t). In order to use speech recognition we use the Gather verb in our TwiML and set input to “speech”. We will also set the action property to our URL, so that when there is a result Twilio will call this function again, and append a query parameter that helps us later to add more call flows. The first time the Function is called there will be no results from the speech recognition with Gather, so we return the greeting. On subsequent calls to the Function we will get a SpeechResult parameter, accessible as event.SpeechResult, which contains the text the API retrieved from the speech. Save the changes in your Function and give your phone number another call. It should greet you with “Hello IT” and once you said something ask you again and again if you tried to turn it off and on again until you say “Thank you” or “Thanks”. Don’t forget to save and you should be good to go to test your support hotline again. We got the basic answering machine done but why don’t we leverage the fact that we can do so much more with Twilio Programmable Voice to try to help the caller. We could do something very sophisticated here but for now let’s actually ask them again for their problem and simply send them the link to the Stack Overflow search page with that question. "Alright I found a few solutions. I'll send you an SMS with them. Bye." That’s it! Don’t forget to save your Function and once it restarts your new IT support hotline is ready to be distributed to everyone who constantly bugs you for help. Use the <Play /> verb to replace <Say /> with the original sound from IT Crowd or your own recordings that you can store in the assets section of the Runtime. Send the actual question to you via Email or Slack. Maybe file a ticket in your system? Port the hotline to one of the other languages supported.